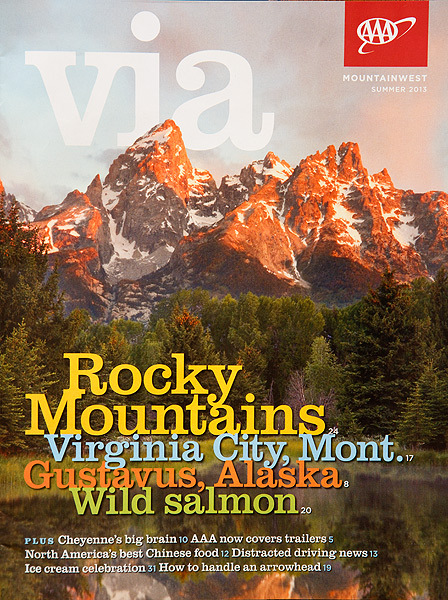 This came in the mail yesterday – cover of Via Magazine! Very cool! I think this is my third cover with this widely distributed publication – thanks! This photo of an old barn in front of the Grand Teton Range in Grand Teton Natonal Park is among our better selling prints. I think we have sold a half dozen or so this year alone. Although we sell a lot of prints year around – over the next month the number of orders we receive increases dramatically. In the past we have always offered free shipping during the upcoming month – I don’t know how much of a difference the free shipping offer really makes, but I don’t want to find out! So, over the next month up until December 16th, any order over $50 will receive free priority mail shipping from our home office here in Alaska. International orders won’t be free, but shipping will be discounted by an equal amount. Don’t worry – if you placed an order this past weekend (Saturday or Sunday), we will apply the free shipping. Like yesterday’s image, the above poster was also part of the market test in LA; here is my original post and photo on that story. 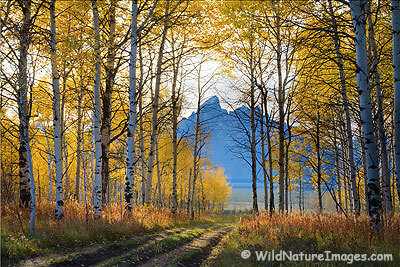 The image was from the Hidden Falls Trail in Grand Teton last year at this time. Hidden Falls, Grand Teton National Park, Wyoming. This photo is also part of the Nature Valley ad campaign for Los Angeles and Orange County, California – this image will be appearing on bus shelters in the area over the next couple of months. 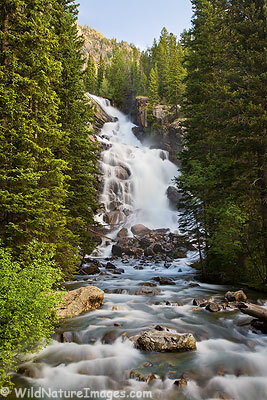 You might remember this images from last summer, it was from the Hidden Falls Trail in the Grand Tetons. 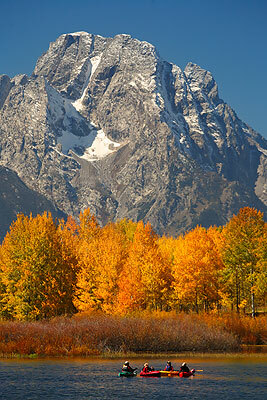 Well we have just updated our website gallery with all our new Grand Teton National Park Photos. Now that we have a fair amount of spring a fall coverage of the area, the lack of winter coverage seems like a glowing hole. Hopefully one of these year. If you followed our travels through the Tetons on our blog, then many of these photos will look familiar. If you have followed this blog for long, you will remember the wonderful time we spent around the Grand Tetons this past June. It is nice to have images from that trip already in print – from pond to print in less then 6 months! This is one of the advantages of digital. During the days of shooting slides, a trip like the one we took to the desert southwest last winter would just now be making it to market. With digital, that trip paid for itself within just a few months! 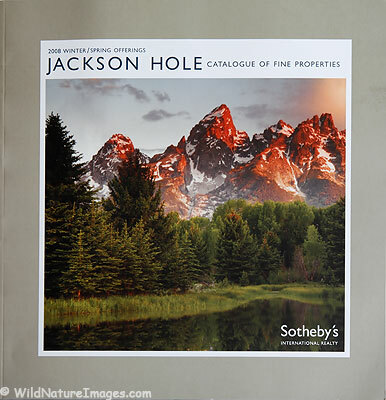 These trips may pay for themselves quicker, but they won’t begin to pay for any of the homes in this catalog! 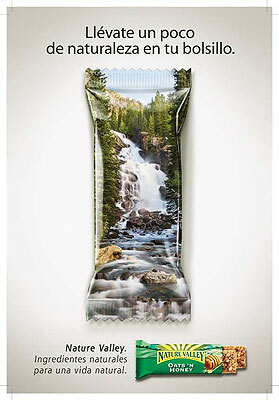 Here you can read more about our travels to the Grand Tetons on the photo blog. 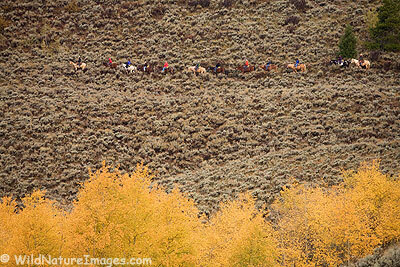 Horseback riders this past fall in Grand Teton National Park, Wyoming. If you followed the link in yesterday’s post on saturation masks, you will realize Tony also offers actions for something called luminosity masks as well. This is another subtle, but powerful tool that frankly I haven’t mastered and rarely utilize, but I plan to spend more time trying to master them over the next month as we begin to adjust our autumn photos.